Let your cat enjoy a delightful combination of seafood flavours. No artificial flavours. 100% nutritionally complete. TEMPTATIONS® Seafood Medley is rated4.7 out of5 by29. Rated 5 out of5 byLittlemiss fromTricks for TreatsI am a cat lover... my furry four legged family members love their Temptation cat treats. Whether it's the "crunchy" plastic pouch or hard plastic container, when they hear them shake they come out of hiding! Regardless of flavour, my 2 kitties will leave what they're doing (or not doing anything at all), to eagerly beg at my feet for a treat. My more active feline friend will rub up against my legs, jump up on my lap and go so far as to beg (meow loudly) for a treat. He's learned to shake paw for a treat and jump and catch it in his mouth. He really loves his Temptations cat treats! On the other hand, my less active kitty commands his Temptations be placed in front of his mouth... what a Prince! Rated 5 out of5 byWombutt fromMy cats ADORE these!The senior (20 years old!) cat in our herd of rescued/adopted kitties has his routine firmly set - canned food twice a day, followed by milk, followed by a minimum of one large helping of treats. I've tried giving them a few different brands of treats, just for variety, but Temptations are the only ones EVERY cat loves - and fortunately those big plastic bins of them elicit the same Pavlovian response as the bags do, when shaken! :-) Thank you for making my cats happy! 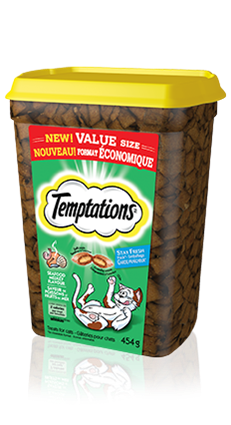 Rated 5 out of5 byK1998 fromLove Temptations Mega PacksI bought this product with intentions to try out a new flavor for my cats and they absolutely loved them. I always buy them now. This has always been a good brand to trust and there are many flavors to choose from. 10/10 would recommend. Rated 4 out of5 byAshleymeaganxoxo fromMy kits loved these!I love my kittens they only get fed the best. I feed them hard food mixed with chunky wetfood twice a day. They love it. I also give them cat nip often before they get their treats. They havent complained! Ha ha. Chicken By-product Meal, Ground Corn, Animal Fat (Preserved With Mixed Tocopherols), Dried Meat By-products, Brewers Rice, Wheat Flour, Natural Flavour, Grain Distillers Dried Yeast, Potassium Chloride, Choline Chloride, Salt, Taurine, Dl-methionine, Calcium Carbonate, Vitamins (Dl-alpha Tocopherol Acetate [source Of Vitamin E], Vitamin A Acetate, Niacin Supplement, Vitamin B12 Supplement, Riboflavin Supplement, Thiamine Mononitrate, D-calcium Pantothenate, Biotin, Vitamin D3 Supplement, Pyridoxine Hydrochloride [vitamin B6], Folic Acid), Minerals (Zinc Sulphate, Copper Sulphate, Manganese Sulphate, Potassium Iodide), Natural Salmon Flavour, Natural Shrimp Flavour, Colour, Mixed Tocopherols (Natural Preservative), Dried Cheese. 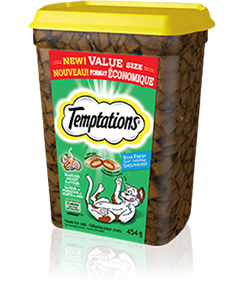 TEMPTATIONS® Seafood Medley flavour Treats for cats is formulated to meet the nutritional levels established by the AAFCO Cat food Nutrient Profiles for all life stages. AAFCO stands for the Association of American Feed Control Officials. AAFCO develops standards for dog and cat nutrient profiles which are used as model regulations in the United States. AAFCO feeding protocols are referenced the ""Guide for the Labeling and Advertising of Pet Foods"" endorsed by the Competition Bureau of Canada as well as in the Guidelines for the Canadian Pet Food Industry, developed and administered by the Pet Food Association of Canada. These documents were created to help pet food manufacturers ensure that the food that they manufacture, distribution and sale of animal feeds are safe and of high quality.